Although I carry my own fabric shopping bags to the grocery store, I actually don’t mind getting plastic grocery sacks. Why? They serve multiple uses in my house – mostly to dispose of super messy items (like used paintbrushes) and to pick up after Boomer when we go for a walk. 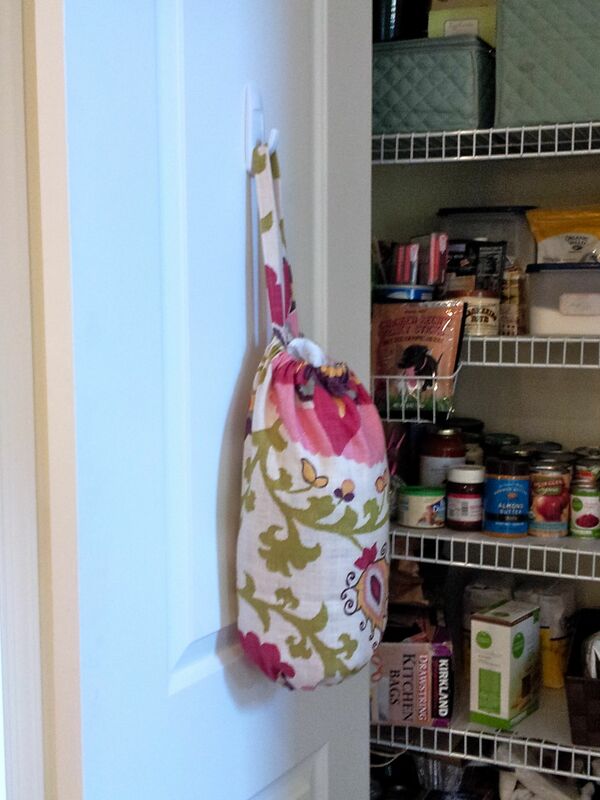 The pantry in my current house is wide and narrow – unlike the deep pantry in my previous home. The plastic crate I used to house plastic grocery bags for nearly a decade no longer works. One of the books I picked up at the public library during a recent visit was 101 One Yard Wonders Fabric by Fabric. As I thumbed through the book, I noticed a plastic grocery sack project. Inspired, I unearthed the home dec samples I’d been gifted last summer and sure enough, I found some that were just the right size and weight for the project. I kinda/sorta followed the directions on the first one and was pleased with how it turned out, but I needed a slimmer/longer one. – Fold fabric right sides together with the 23″ sides meeting. This will give you a long, narrow tube. – Turn up a 1-1/4″ hem on each end of the tube. Press. – Open hem back out and press up 1/4″. – Turn the now 1″ hem back up on each end of the tube. Press. – Pin the hem in place. – Edge stitch near the fold all the way around the casing. – Stitch the other side of the casing, leaving a 2″ opening at the starting/stopping point for elastic insertion. Hint: Using a free arm makes this process much easier as does setting your seam guide for 7/8″ when stitching the “hem” side. – Cut a 15″ piece of elastic. – On your cutting mat, make a mark 3″ from the left side. Now measure over 8-1/2″ and make another mark. – Insert elastic into casing. – Overlap elastic ends at marks so that elastic lies flat (make sure it isn’t twisted in casing). – Sew elastic together along mark (straight stitch or zig zag in place back and forth several times). – Trim away excess elastic. – Stitch opening closed (you might have to persuade the fabric to lie flat). – Press up 1/2″ hem on each short end of the rectangle. – Fold rectangle in half lengthwise wrong sides together. Press. – Open rectangle out. Fold each long side in so that it just meets inside the crease. Press along folded edge. – Fold rectangle in half again lengthwise. – Match edges and edge-stitch all the way around the strap (can skip lengthwise fold if you wish). – Decide which way you want your bag to hang. Make note of the top end. – Locate the seam on the inside of the top casing. You will place the strap ends on either side of this seam (inside the bag on top of the elastic and casing). – Place the strap ends so there is about 1/2″ of space between the seam and the edge of either strap end. – Pin in place. Edge-stitch strap in place. To add a custom look and strength to your project, sew an “X” in the middle of the square where you sewed the strap down. – Stuff with 20-30 plastic bags, hang in pantry and enjoy.